Firstly, I don't know how big to make the windows. There are pros and cons to both large and small windows. My hives are made from 25mm marine ply and I'm pretty sure the current construction won't sag or warp. However, I'm worried that routing out slots on one of the walls will weaken them and possibly compromise the whole hive. That leads me towards making very small windows, to reduce the chances of warping. I'm thinking that 6-8cm high and 20-25cm wide would be enough to give me a good view of the brood nest. However if the window is too small, I may have to open the hive for inspections more frequently, partially negating the value of having a window in the first place. I'm also toying with the idea of drilling 6-10 holes, 19-22mm diameter, on 38mm centres along the brood nest area and then putting a strip of glass behind them to make a series of peepholes. Each one would only give a view of 1 comb though. Should the window be the full length of the brood nest? I don't have the experience to answer this question. Secondly, I think that the window should be flush with the inside wall of the hive. This will make it easier to cut the combs free from the wall/window if and when I need to do that. However this means that the glass will have to be glued into the slot that I cut out for it and will have no other means of attachment inside the wall. Is that a potential problem? Thirdly, I don't know how much light is needed to see inside a brood nest. I could install some red LED lighting during the construction phase. I don't know if it is needed though, perhaps sufficient light will come up through the mesh floor. Finally, how long does an observation window actually remain useful without needing to be cleaned? If any bit of light gets in there will the bees begin to cover it in brace comb? If it needs cleaning on a regular (monthly) basis, I think I'd rather not go to the effort of installing it in the first place. All answers to any of the above questions will be gratefully appreciated, but please indicate if you have experience with observation windows or if you are speculating. I've just constructed my first observation window hive, but it's not in use yet. I'm already giving thought to my next one though and my plan is to cut the window hole out of the plywood side of the hive and then attach a sheet of Perspex the full size of the plywood, so that one internal sloping wall of the hive is perspex on the inside. My thinking is that this will act as a condensing surface for water and prevent it potentially puddling in the join between window and side where it has been routed and potentially starting to rot. It will leave a smooth surface to remove attachment and strengthen and insulate the hive wall. The cut out from the ply can be used as the external cover flap as the depth will be correct since no routing has been done and a bit of moulding put around the edges to cover the saw cut gap. Haven't tried this yet, just thinking about it from a practical, ease of construction and hive environment perspective. Personally I'm not keen on open mesh floors and I know of a number of swarms that have refused to take up residence with them open. My National Hives have solid floors and my top bar hives are deep litter. I think you will definitely struggle to see much through your peep holes especially as the brood nest is always packed with bees to look after the brood. I think all you will see will be the bees nearest the window and nothing of the comb. Anyway, that's my two-penneth worth. The idea of using a wall sized sheet of perspex is very interesting. However I have some pieces of cracked glass that have been waiting for a purpose for far too long. I intend to get them out of my way by cutting them to size and putting them in the hives. I'm thinking of experimenting with an eco floor on one of the new hives. That's kind of what led me towards installing some red LED lights in that hive. What size did you make your first window? We used perspex because that's what we had lying around. 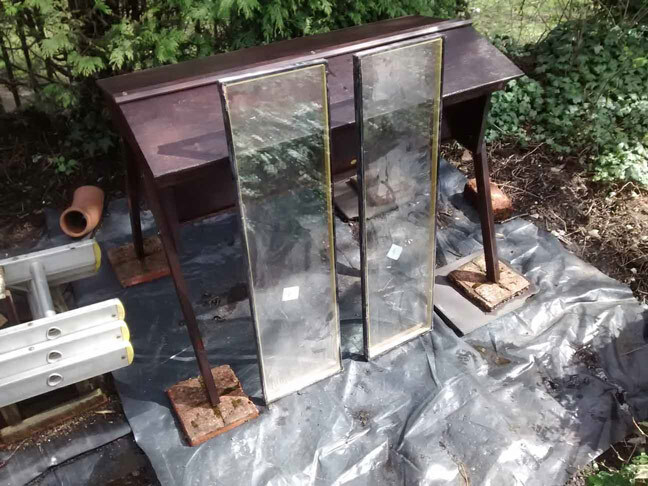 I do have a piece of glass I was thinking of using if we get around to building a Perone hive but the way the top bar is so long one would want to be careful that the glass did not crack with the movement of timber. I think that glass is a colder surface than perspex but that is just a gut feeling, no science from me! I found the windows were brilliant in winter for seeing where the cluster was (they really moved through the hive), what size the cluster was (on warm days it would expand a lot), and for seeing how much honey was left (I could see the cells along the edge near the window were full into January and then one could see the combs shrinking in width. All very interesting as I am a visual person. Yes they are covered in propolis and will become more so but it is sufficient to see what needs to be seen. Windows are also great if I find a swarm in a tree and I am not sure from which hive, a quick window peek does show the swarmed colony with much fewer bees. My first swarm in May I also anticipated as that hive was packed with bees, through the window there was hardly room to move. I find there is good enough light to see what I need to see with no light coming from within the hive. So I will be no help on the technical aspect of routing glass into marine ply, just a very enthusiastic window advocate! Ours are routed into 1 inch timber and as our hives are closer to 5 foot than 4 foot we have 2 windows one for each end, this leaves a strip of timber in the centre and keeps the whole side more stable, I'll see if I can find (or take) some photos. I agree with Barbara about the mesh floor. Like Kim, I had Perspex lying around which is why I used it and I can cut it to size myself. My window is 35 x 6 inches roughly. My hive is made of pine cladding which was reclaimed from a shop refit. It wasn't very thick, so I put the lengths horizontal on the inside and vertically on the outside which should help prevent warping, especially as it is also tongued and grooved and of course makes the walls a reasonable thickness. Kim those are really interesting and useful observations of the colony's progress as viewed from the outside. I look forward to seeing it for myself this next year. I have 2 TBH, both with viewing windows, and I LOVE them!!! They are, I think, my favorite part of my hives. However, I only had bees for one short season before they died (I'm sure it was my fault, not the windows'), so can't offer too much practical advice. But my windows are pretty much the entire length and most of the height of the hive, just a couple/few inches on each side left. I purchased the hives, so don't know what they were made from, but they've stood up well. I've had them sitting empty, hoping for a swarm to adopt me, and my mini horse has gotten out with them and knocked them over, etc (they'll be moved before I put bees in them this year!). I never had a problem with light, and my hives have solid floors. The windows are usually covered; I don't think the bees would stay put if they weren't. The window material (I presume plexiglass?) is just a big bigger than the window holes, but I never had any problem removing brace comb. I love being able to see how things are frequently, without really disturbing the bees much, and also see how the comb is before I go in the hive. Very helpful. I'll be making a few more hives this year, and will DEFINITELY be putting viewing windows in ALL of them! Hope that helps! I'm already giving thought to my next one though and my plan is to cut the window hole out of the plywood side of the hive and then attach a sheet of Perspex the full size of the plywood, so that one internal sloping wall of the hive is perspex on the inside. My thinking is that this will act as a condensing surface for water and prevent it potentially puddling in the join between window and side where it has been routed and potentially starting to rot. Thank you Barbara. I was thinking about the same, except I was going to use triple-sheeted glass on a complete side (no wood). [A] I had the same thought about rotting of condensation at the bottom of the window. Does anyone have that problem ? Then I am worried about how the glass will disturb the temperature gradient. Because the inside sheet of glass is at the same time at hive temperature on its top, and close to outside temperature on its bottom (I presume a deep floor). Since glass is conductive, I presume that although the insulation from outside/inside would be perfect, the insulation from bottom to top would be very bad. [B] Do people have experienced problems with windows that expand vertically over most of the hive's side ? This is what I'm playing with.......double glazed units for the long sides or one wooden side and one glass side. Can't decide whether to go for a rectangular section hive(is that Tanzanian) or Kenyan profile. I think Rectangular would be better for sealing especially at the bottom which will be solid. The units I got are very near the size in PC's plans and were ordered the wrong size for the intended window.....sob........so I bought them. Not got any further than thinking atm. Personally I would just put the glass on one side. The glass is going to provide a condensation point within the hive during the winter as it is a colder surface (better conductor) than wood and I think the bees might prefer to cluster away from it. Not suggesting you don't use it as the fact that moisture will condense on it may be beneficial, but I would just be inclined to limit the area of it so that the bees have a "warm side" away from it. The advantage of the Kenyan is that there should be a minimum amount of comb adhesion to it due to the sloping sides, which will allow better viewing over time and less disturbance to the bees during normal inspections since less cutting of side attachment will need to be done before a bar can be removed.